Since the founding of Lawyers to the Rescue, many Honorable South Florida volunteer Attorneys have successfully put the organization’s missions into action. Lawyers to the Rescue‘s legal clinics for the homeless at Camillus House have helped the homeless receive legal assistance that they would not have been able to receive elsewhere. Most recently, one of Lawyers to the Rescue’s Board of Directors and volunteer attorneys, the admirable Criminal Law Attorney Scott F. Kotler, used his expertise to aid a South Florida homeless woman to obtain almost $6000.00 recovered from the Florida Department of Revenue. The client was Ms. Christina Amat-Martinez, a Cuban refugee who has been living in various shelters around South Florida since the passing of her husband. She had reached out to Scott Kotler during one of Lawyers to the Rescue’s legal clinics at Camillus House in downtown Miami. Scott Kotler, along with his legal assistant, Katherine Boyle, worked vigorously with state officials to make sure Ms. Amat-Martinez case was successful. Kotler expressed, “As Ms. Amat-Martinez walked into the clinic, something struck me about her. She came in with an optimistic smile and a heart full of hope.” Through the screening, Kotler found out that Ms. Amat-Martinez had migrated from Cuba over thirty years ago with her husband, fleeing their oppressive government. Her husband worked in construction while she took care of the house for twenty- five years. Unfortunately, after the passing of her husband who had left her little money, she soon found herself homeless and out on the street. She believed there was some unclaimed money lost during the process of her husband’s passing, and reached out to Kotler for assistance in getting it back. “At first thought, this mission was short of impossible. We had nothing to go on to find her missing claim.” Kotler had trouble finding Ms. Amat-Martinez’s information, but through some in depth investigation, he and his legal assistant, Katherine Boyle, were able to locate information about her claim and found $6000.00 being held by the State. Shortly thereafter, Ms. Amat-Martinez, with Kotler’s help, was able to sign some paperwork and clear some legal hurdles. 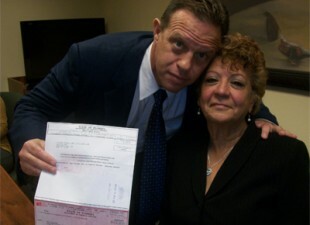 The check was sent to his office and was presented to her at Mr. Kotler’s office. “Ms. Amat-Martinez was very poised and well kept. This wasn’t a person who was out on the street due to mental illness or drug addiction. This was a woman who was just down on her luck. What’s so great about her story is here is this woman who’s homeless through no fault off her own; she held onto the last bit of hope she had and through some miracle knew she could allocate the funds back into her hands.” From the beginning, Kotler knew there was something unique about this woman and her case. He rolled up his sleeves and took the initiative to change this womans’ life forever.